Israeli media has undergone significant changes over the past few years. Growing economic strains have increased competition between media outlets fighting for a share of advertising revenue. However, because the market that media outlets operate in is relatively small many are experiencing serious financial problems. 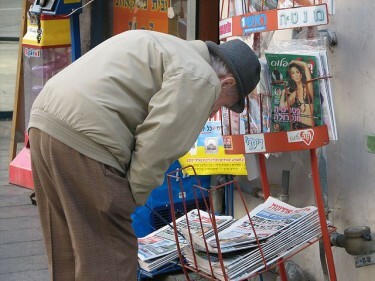 This includes the daily newspaper Maariv, which was recently sold to a right-wing publisher. As a result, many of the newspaper’s workers are expected to lose their job. A similar fate may fall upon employees at Channel 10 and the only left-leaning Israeli daily, Haaretz, which are also incurring heavy losses. מה שמניע מגמה זו בישראל אינו הזדהות אידיאולוגית, אימוץ גלוי ואמיץ של אג'נדה חברתית או מחויבות ארוכת טווח לקו פוליטי. מי שמעצבים תהליך זה בישראל הם שיקולים תחרותיים, עסקיים ויוקרתיים. הזדהות עם או יציאה נגד מנהיג פוליטי או מפלגתו אינן בחירות מערכתיות המבוססות על בחינת עמדות והערכות בדבר נכונות הדרך. אלו בחירות המונעת לעתים על-ידי שיקולי תחרות (“אם המתחרה שלי הוא בעד, אז אני נגד”), ולעתים על-ידי רשת סבוכה של קשרים עסקיים, שותפויות בבעלות צולבת של תקשורת ועסקים. What causes this trend in Israel is not ideological identification, an unabashed and brave adoption of a social agenda or a long-term commitment to a political worldview. What shapes this process are competitiveness, financial considerations and prestige. Support or opposition to a political leader or his party are not choices made based on a worldview or assessments regarding whether the leader is right. These are choices that are often motivated by competitive considerations (“if my competitor is for him, I am against”) and sometimes by an intricate web of commercial connections, and cross ownerships of media outlets and businesses. The desire to maintain a large number of viewers, listeners or readers has increased the importance of ratings and the desire of media outlets not to report matters that might decrease their audience. Israeli media outlets attempt to reflect to their audience what Israeli society likes to think of their country: as a moral, powerful country that only acts in self-defense. This is one reason why the coverage of the Israeli-Arab conflict is generally very sympathetic of the Israeli government’s narrative. One recent example of this bias is the coverage of the killing near the Gaza-Israel border of Anwar Abdul Hadi Qudaih, a 20-year-old Palestinian. IDF soldiers shot at Anwar after the cease fire that was brokered between Hamas and Israel following Operation Pillar of Defense came into effect. Israeli media adopted the IDF’s line that Anwar and 300 other protesters attempted to breach the border fence and enter Israel. A video of the event showed that the number of protesters was in fact closer to 30 and they were not close to the border fence when the IDF shot Anwar. זה לא רק צה”ל שמפעיל כוח בלתי סביר בעליל, אלא גם התקשורת. ומה נותר לנו? לחפש באתרי חדשות מהעולם את האמת? לכתוב פוסט שיקרא על ידי אלפים בודדים ויותיר מיליונים חשופים לאש החיה של התסלופת הישראלית? כמו עם הפלסטינים, כמו עם אנואר, זה פשוט לא כוחות. כנגד סרטוני יוטיוב ופוסטים בשולי השוליים, עומדת התקשורת ומפגיזה את הקורא – אם בידיעות מעוותות ואם בחוסר ידיעות על האמת… אתם, העיתונאים והעורכים, החתומים על הכתבות הללו, מרגישים בנוח בגלימה השחורה, שאיש לא התיר לכם ללבוש. אתם חורצים את דינם של אנשים, שלא נותר להם בית משפט אחר מלבד התקשורת (כי בתי המשפט שלנו לא יקשיבו להם). ובמחיקתם וסילופם, בכך שאתם “רק עושים את תפקידכם” כשופרי דובר צה”ל, אתם אינכם מדווחים את המצב, אלא מייצרים ומנציחים אותו. It is not just the IDF that uses excessive force, but also the media. What are we left to do? Search international news sites for the truth? Write a post that will be read by a few thousands but will leave millions exposed to Israeli propaganda? Just like [Israel’s conflict] with the Palestinians, the forces are not evenly matched. Against YouTube videos and marginal posts, stands the media, which either bombards the reader with false reports or just does not report about the truth… You, journalists and editors, who are responsible for these reports, feel comfortable in your black [judges’] gown, which no one allowed you to wear. You seal the fate of people who have no trial left to stand except the media (since our courts won’t hear them). When you distort the truth or erase them, when you are “just doing your job” as the mouthpieces of the IDF spokesperson, you are not reporting on the situation, but creating and perpetuating it. Increasingly, citizen journalists and bloggers fill in the void of Israeli mainstream media coverage. Bloggers such as Ishton, Idan Landau, Yossi Gurvitz, Haggai Mattar, Noam Rotem, and Yair Kaldor cover and offer commentary of issues that are often neglected by Israeli mainstream media.